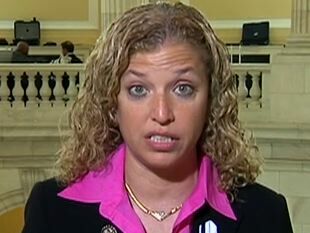 Debbie Wasserman Schultz again attacked Rep. Allen West today on the Andrea Mitchell Reports program. Her assertion that it is not surprising that Rep. West would ‘crack under the pressure’ has ratcheted the rhetoric in the battle between the two Florida Congressmen. She has responded to Mr. West’s challenge to make this personal since attacking someone’s mental acuity has pulled any gloves off in this fight. “Let me make myself perfectly clear, you want a personal fight, I am happy to oblige,” wrote West, a tea party favorite elected in November. “You are the most vile, unprofessional, and despicable member of the US House of Representatives. And yet the debt ceiling crisis deadline is fast approaching with no solution presented that will pass the House, Senate and president. The impasse in Washington is showing the people that political parties are more important than our country’s future inside the Beltway. This entry was posted in Editorial, Elections and tagged Allen West, NC Renegade, Oblermann, Wasserman Schultz. Bookmark the permalink. Congressman West made his remarks AFTER Rep. Schultz “Personally” TRASHED” Him… AND there was no mistaking who she was referencing in her Personal Political Attack upon another member of the U.S. House of Representatives. Question: How can ANY Democratic Congressman or Senator stand by, while President Obama implies that Social Security Checks or payments to Veterans May Not Go Out (when we have the money for them). It’s a Liberal Lie to say that we will not have the money to pay, the interest on our debt, money for our military, as well as these other two items AFTER August 2nd. Schultz suffers from a “DEFICIT OF DECENCY” and she needs to read Zell Miller’s book on that subject. A comment (in another newspaper) today referred to Representative Schultz as “Pelosi’s Poodle.” I would liken her to a Pit-Bull conditioned to fight (and nothing more). The sad fact is that My Party has replaced Tim Cane (a moderate Democrat) as the Chair of the DNC with a female “Alan Grayson,” and it will pay for it on Election Day in 2012. As for Allen West, he WILL be Re-Elected, because “Reagan Democrats,” like myself will work to see that he is…so get used to it you Liberals.